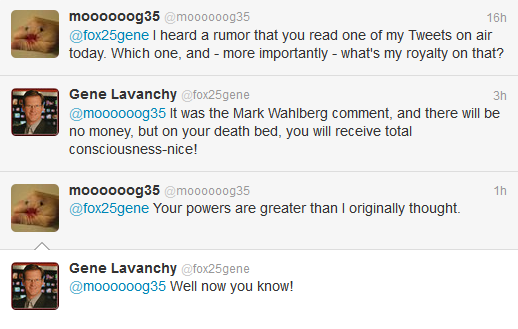 A little while ago I professed a bromance between myself and a local Fox 25 News Anchor named Gene Lavanchy. I just scared myself a little there. 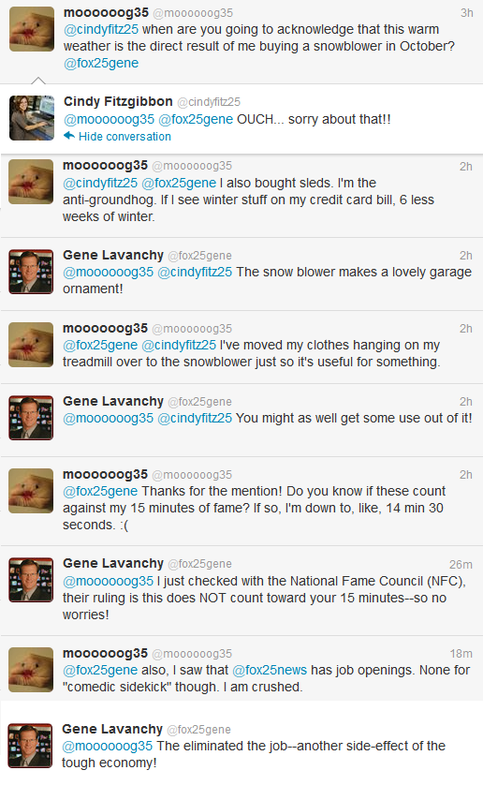 Regardless, Gene and I still go back and forth on Twitter so he really has no one else to blame for this but himself. 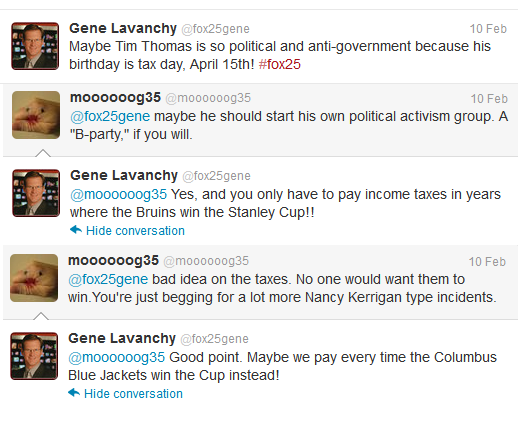 Enjoy some more of our repartee. Before I get rolling, I have to mention Gene's co-host, Shannon Mulaire, who is pretty hot and can certainly play with the big boys when it comes to dishing it back. Then they did a fluff piece where there would be a parallel-parking competition between the morning hosts. Notice he cc'd Shannon on that one. Then in February we had received approximately 1/2" of snow here in New England which is typically 999-1/2" less than usual so the weather woman, Cindy, was talking about the uncommonly mild weather. 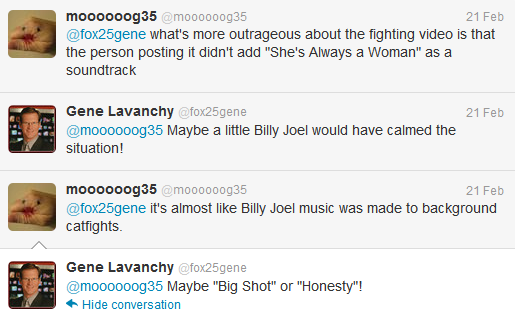 Please note that around mid-conversation here, Gene actually reads my Tweet on the air. One of the top stories on this day was about someone posting a video on YouTube of two girls totally beating the bejeezus out of each other for, like, 5 minutes. I know. AWESOME. But the topic at hand was how outrageous it was for all the people surrounding the fight to continue filming but not try to stop it. For some reason the Boston Bruins goalie, Tim Thomas, went off on a month-long anti-Obama thing and that's all that anyone could talk about on the news. HEADLINE: "JetBlue pilot goes crazy mid-flight. Passengers subdue him." 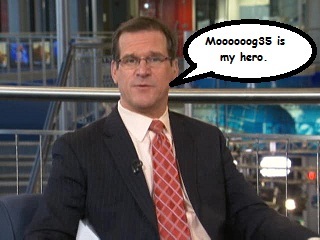 Then I found out later on that Gene actually read that on-air but I missed it. HOWEVER, I did NOT miss this on-air mention when the main story was how a local elementary school wanted to change the lyrics to that song, "I'm Proud to be an American" from "God bless the USA" to "I love the USA." 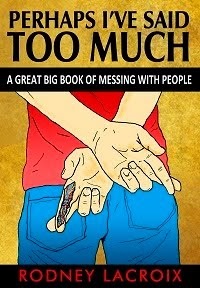 In a completely harmless and fully heterosexual man-love kind of way, of course. 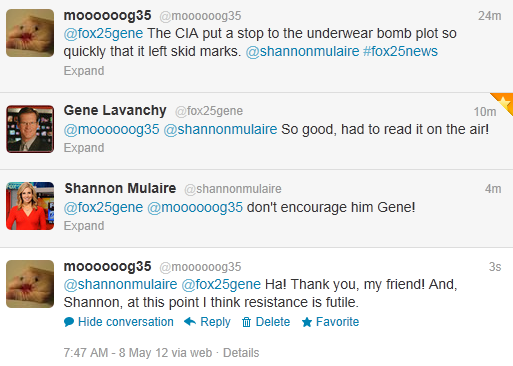 Fox was doing a story on how the CIA foiled another 'Underwear Bomb Plot' by Al Qaida. You, Sir, are a rock star. I bow to you and humbly thank you for allowing us peons to follow you here. Seriously though--pretty freaking cool. I'd crush on him too...he's pretty good looking. I know a tv personality too! She was even a first runner up in the Miss American competition! Maybe if I am lucky she will read my stuff on the air, only I live so far away from the place she is on air that I don't get her station so I will miss it. As for your man crush, try to keep it together here! We don't need the intimate details. The guy in the lower right hand corner on the video looks like he doesn't know what day it is. 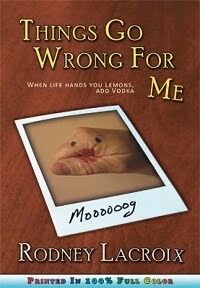 He can get a since of humor at Wal Mart for $9.99. god, you crack me up. Loved the on air video. you rock. Who wouldn't have a man crush on a man capable of that kind of repartee? that is so cool! 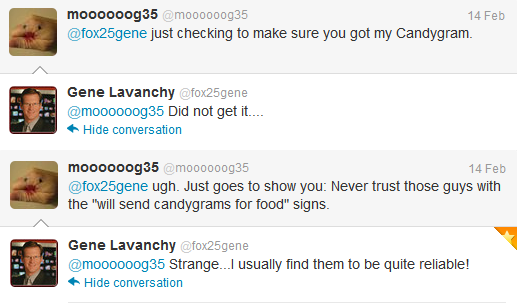 I love that you have that ongoing conversation, and that he actually reads your tweets on the air! Are you sure this doesn't count against your 15 minutes of fame? 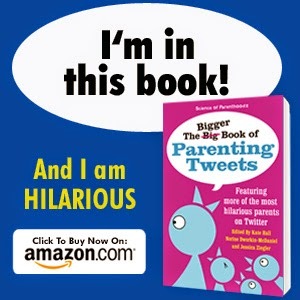 Honestly, how long before you are asked on the show to find out how you come up with your witty tweets!? Or become the news station social media reporter!? I'm waiting for the day when you and Gene are on air together and he just turns and starts making out with you. 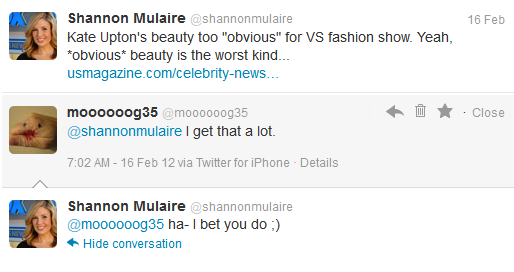 I like that Shannon woman. I always read comments where people talk about how they found something so funny that they ended up spitting up their coffee. Well, I was eating, and I almost choked.